Just got this SMS text Message. 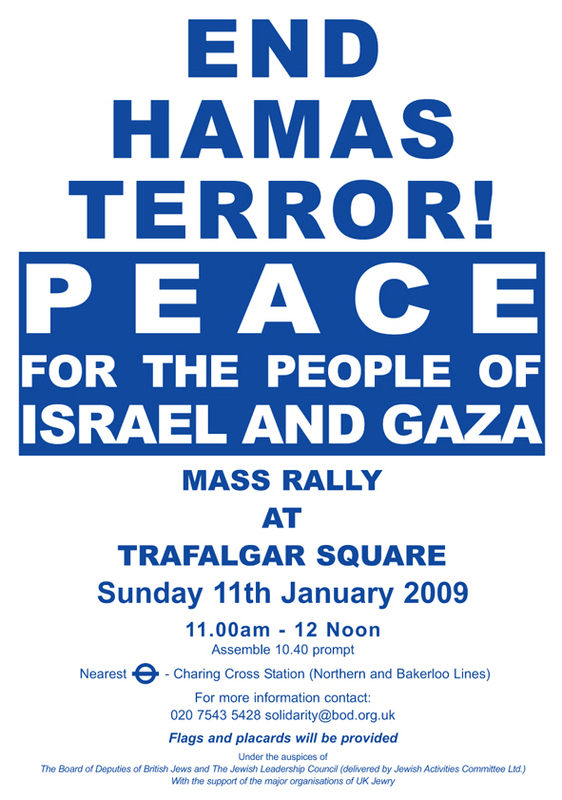 The rally 4 Israel is on Sunday in London Trafalgar Square and Manchester Albert Square 11am. Want everyone there. Spread the word. Further information is on Facebook. So far nearly 5000 people have been invited and 500 accepted. The last big rally pro Israel in London attracted 40,000 people. Question if we can get more out this time. BEWARE: There will be a counter demonstation from some of our Israel-hating friends. What a disappointment… I was just hoping that Matisyahu were one of those few jews with consciousness. I think he does have morals. Why is it that those who support human rights and dare up to stand up against Israeli treatment of Palestinians are immediately attacked for being Israel-haters or anti-Semetic? It is sickening that people are so narrow minded. Intellectuals of every faith and nationality, including those Jewish, KNOW that there will be no peace until the Palestinians get a state of their own alongside Israel. The end of the occupation is the best outcome for both parties and for the political stability of the world. How could this guy and his song “ONE DAY” be ignorant of the palestinian’s situation… its such a good song, I’m just a bit dissapointed. STOP ALL WARCRIMES NOW! I just recently heard the song, “One Day” and was very impressed by it’s beautiful unifying lyrics about peace. I Youtubed the official video and was happily surprised to see a woman wearing what looked like a kufiyah (Palestinian scarf) featured. I was hoping that he was someone I could support and look up to as a Jew who did not support Irael’s oppressive policies towards Palestinians. As the president of my university’s Students for a Free Palestine organization, I actually sometimes find myself in the position of defending Jews from those who would claim that they are all Zionists and violators of human rights. I am bitterly disappointed to find out that someone I had hoped to use as an example of someone with a conscious about such things actually does support the Zionist agenda. I am hurt that someone could be so hypocritical as to write beautiful songs about wanting peace and then support an apartheid state that commits human rights violations everyday.